For quite some time I've been crafting multiple applications that, to the end user, appear as one. This is possible with some Session Sharing attributes in relevant the Authentication Scheme, a feature agnostic to the Scheme Type. This ultimately means you can set up two different applications that use two different methods of authentication, thereby letting in two different sets of users in the 'same' application - you just need to make some UX decisions. APEX 18.x introduced a 'Type' option, and renamed the section from a less descriptive 'Session Cookie Attributes'. I thought this was offering something a little bit extra, but it appears to just make the process a little simpler for the likely majority. 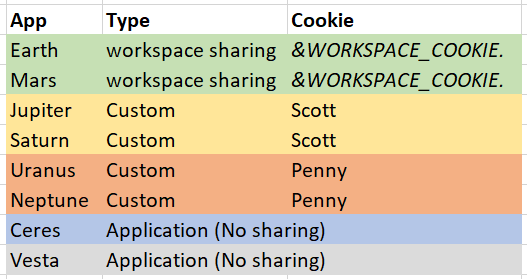 We can still segment our applications, where users of applications with the same cookie name / colour may have links that jump seemlessly between applications, such as Earth and Mars. If the user tried to jump to Jupiter, then they will be prompted for login details. Ceres and Vesta stand alone with the default option, sharing authentication with no other apps, not even between themselves (unlike a certain spacecraft). Upon returning to the authentication scheme for Earth, I noticed the Type actually changed back to Custom, and I saw an (undocumented) substitution string WORKSPACE_COOKIE used. 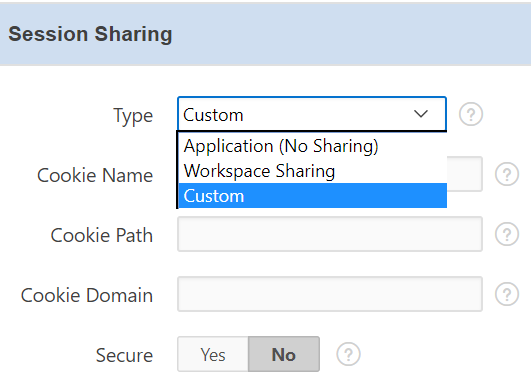 This saves us from having to nominate the cookie name, and store the literal ourselves, perhaps as a custom application substitution string. It just presumes that all apps in our workspace we nominate as such are to share authentication. I thought I read some attempts on the forums to change the 'current' authentication scheme on the fly, but I don't see any mention in the documentation - Correction.